Interview with BlockMesh & Smart App Tech co-founder, Jason Griessel. Interview with Smart App Tech co-founder and CEO, Jason. At BlockMesh, our aim is to enable cost-free communication by creating a global mesh network which allows our users to skip typical cellular and ISP “toll roads”. Alongside this, we are developing a wallet and digital payments gateway which will give greater freedom to the unbanked. Through mesh networking and blockchain technology, we aim to empower our users to connect with one another at next to no cost, and also give them an easy, alternative new way to buy goods and services. Smart App Technologies is a specialist software development company with a focus on building a mobile-based digital asset payment system, rewards environment and analytical software applications for use in over 20 000 retail outlets throughout Africa. This week our Head of Digital Operations, Matthew Schulz, was lucky enough to wrestle away 30 minutes from Jason, the co-founder and CEO of Smart App Tech, to get an inside lane on the partnership these two companies just announced. Read on below to follow their conversation with Matthew (MS) asking the questions and Jason (JG) answering them. MS: You’re the co-founder and CEO of Smart App Tech (SAT), can you tell us more about what SAT is and it does? JG: Quite simply, SAT has put together a mobile wallet ecosystem to bring blockchain efficiency to retail. MS: Ok, so what does that mean in layman’s terms? JG: Well, we’ve developed and are busy integrating a token-based payments system which runs on the Ethereum blockchain which will allow points of sale terminals at your favourite shop, to accept digital currency (the tokens) as a form of payment for your goods and services. Basically, we’re working on a way to make digital currency an actual alternative payment method in the places that need it most, starting in Africa. MS: So Smart App Tech, Ecentric and BlockMesh have recently announced a partnership, why has SAT chosen BlockMesh to partner with? JG: We look to partner with others with aligned visions, our flexible ecosystem is a differentiator to our partners, we have many more partners that are working behind the scenes enabling our roll out. Whilst I wouldn’t say we are in “Stealth Mode” we are definitely more interested in tangible deliverables instead of hype. We believe in delivering solutions, proving them and then communicating them and we see BlockMesh as a partner that can help us make this happen. MS: How will this partnership work and what does each member provide? JG: BlockMesh provides an ERC20 based token, ultimately allowing tangible exit through our ecosystem. Ecentric is the choice switch of established retailers and comes with very robust experience and pedigree. This all enables us to roll out very quickly and move towards the developing sector quickly, with a focus on the lower LSM market. MS: Ok, so only having just recently announced this partnership, what are the next steps? JG: Integration into the retailer’s point of sale systems is the planned next step and we await all participants to align, this should happen in the next 90 days on current project planning. MS: What is it about BlockMesh that made SAT take notice? JG: BlockMesh is hoping to participate in the basic communications of developing Africa, this is important for transactions and payments. MS: What are your thoughts on the future of communications platforms in SA, such as WhatsApp, Signal, Telegram and do you see a space for BlockMesh chat in this arena? JG: All of the aforementioned platforms need data, data is a commodity that not everyone can afford, we need the participation of everyone in the digital economy. Until we have open access to basic communications this cannot realistically take place. MS: What is the estimated roadmap for the rest of 2019 with regards to the remittance token deployment? JG: We are approaching the remittance token model with regulation in mind, we participate in the Intergovernmental Working Group on Cryptocurrency, this platform enables us to engage at the highest levels to ensure our solution is compliant. We believe we have a compliant solution and the sign off of that will enable quick deployment into remittance, especially into African regions. MS: Well, that was insightful! Thanks for your time and candour, do you have any parting thoughts, concerns or comments? JG: Technology is changing faster than we can deploy it in any meaningful manner, there needs to be a congruence of expectation and value in the real world; less noise and instead more actual achievement in fintech and blockchain for them to make a real impact. We hope you enjoyed this quick insight into the plans of both companies, and shed some light on what has been happening in the backend, especially with regards to BlockMesh. Is there anything else you think Matthew should’ve asked? Would you like us to do more articles and interviews like these with our team members and partners? Let us know via Twitter by tweeting to us on @blockmesh_io and use #BlockMeshAsks. 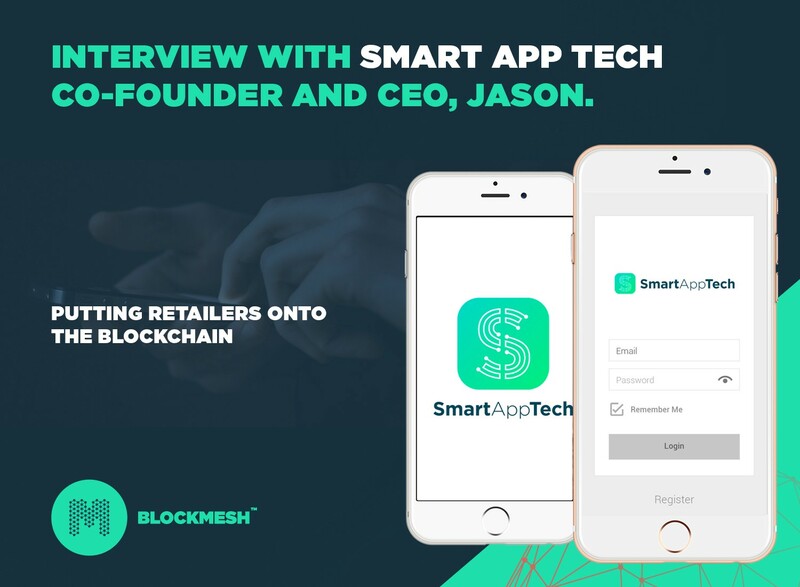 Disclaimer: Jason is the co-founder of Smart App Tech as well as BlockMesh.